I am writing to you on behalf of Mark Nicholson, husband of my sister, Linda Nicholson. 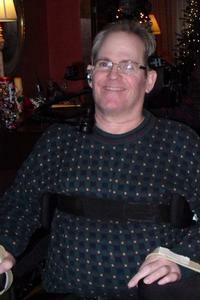 As many of you know, Mark suffered a severe cervical spinal cord injury last May as a result of a tragic fall. He was diagnosed as a level 4B/C quadriplegic. A graduate of Memorial High School and Oklahoma State University, Mark is an ardent Cowboy’s fan and sports enthusiast. He and Linda have two daughters currently enrolled at OSU who are carrying on the Nicholson tradition there. Their eldest daughter resides in Atlanta with her husband. After two years Mark has made some progress. He has limited movement of his legs and arms, and some movement in his hands. His spirits remain good and and he is happy to be alive! We were so glad to hear that you were able to be at Resurrection last night. Our love and prayers to you, Linda and the girls. Best wishes to you Mark. Prayers sent your way for many,many, continued successes, for you, and Linda. Sue M. and I have been friends since we worked together @ Christian Hosp in St. Louis, MO. love to you and Linda, who I met years ago.